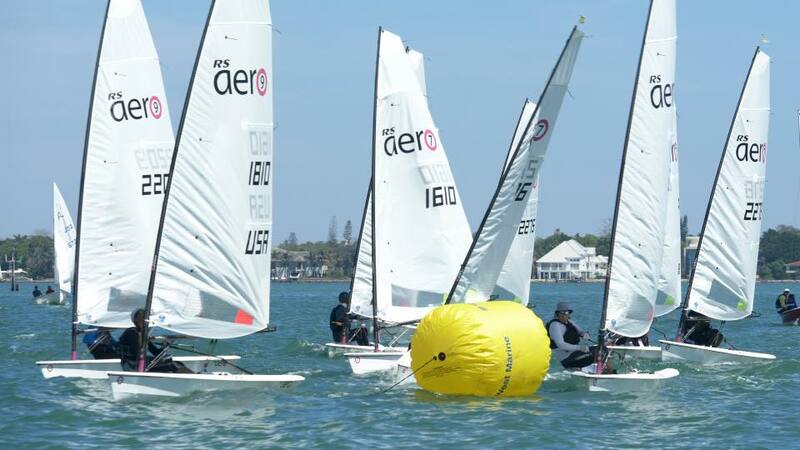 The RS Aero fleet visited the Sarasota One Design Midwinter Regatta for the first time as Round 4 of the five event RS Aero North American Midwinter Series. Travellers came from eight American states and the UK, escaping the snow in both New England and old England! The RS Aero Mega Tour trailer rolled in again, providing 10 charter boats for the far travelled and the first timers, allowing the convenience of a simple 'fly in' solution. 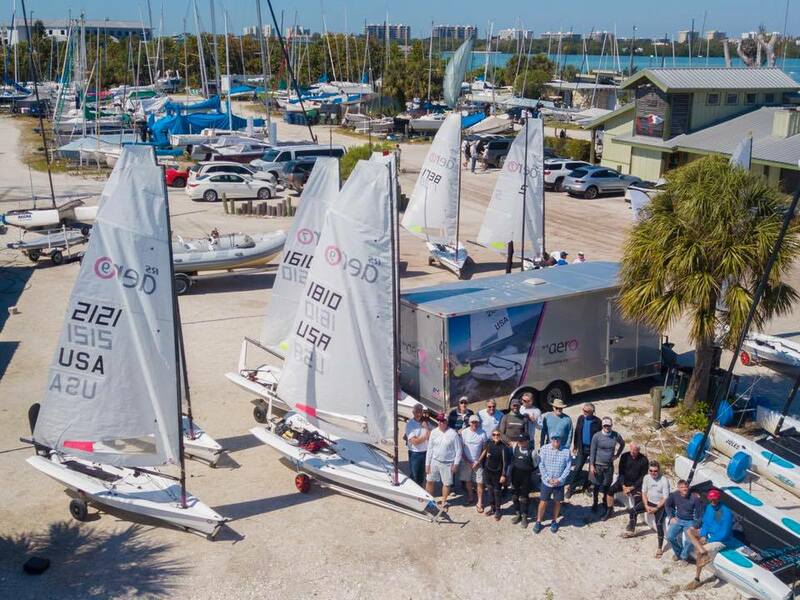 Thursday was a Marc Jacobi RS Aero clinic bringing the new RS Aero sailors up to speed and working on the technique of the existing sailors. A good medium breeze allowed the 7s to hold the 9s upwind in the 'quick fire' starts and windward dashes. 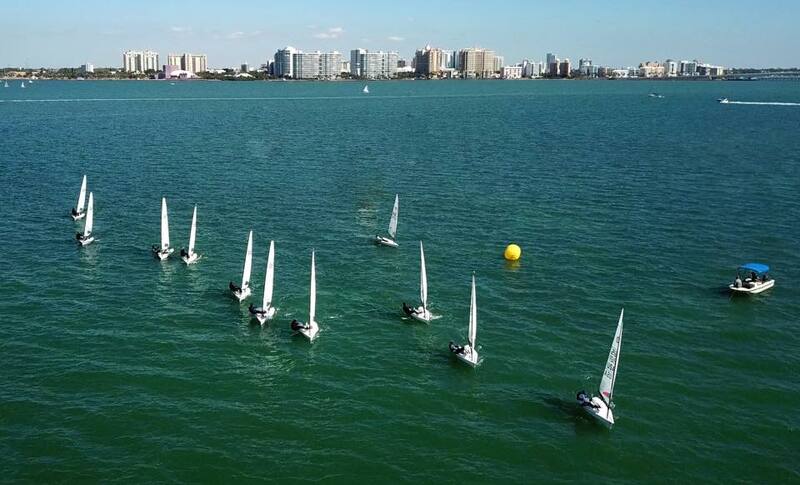 Racing started on Friday in a medium breeze. Madhaven Thirumalai and Peter Barton were toe to toe in the 9s with Peter edging wins by small margins. Mark Jacobi pulled off some good comebacks in the 7s to take wins from Karl Thorne and two overall Portsmouth Yardstick firsts. RS Aero first timer, Sean Fidler, of the Great Lakes (MI) made first 9 rig in race 3, watch out for him! Saturday proved lighter and Madhaven was starting strongly and sailing fast, going on to take the first two wins. The 7s were now struggling to hold on to the 9s on corrected time. Peter pulled off the third win and with it the regatta as due to a lighter breeze racing was not possible on Sunday. Perhaps the most notable performance step of the event was David Solnick's meteoric rise in the nine boat RS Aero 7 fleet with a 7,1,1 on Saturday. He was spotted sailing upwind in the first race looking like he was out 'cruising', not racing. He had an eased leach and little vang, inhibiting good progress to windward. A quick pep talk and example followed on the fineties of 'Trundling' upwind in 4-6kn. When and how to select high mode for pointing or low mode for acceleration. Mainsheet tension & ease and how to assist steering with control of that leach tension and body weight. David was transformed into a racing ninja and ready to take on any World Champ! Hot out of the blocks there was no stopping him and he went on to score two firsts in the RS Aero 7 fleet! Thanks to Sarasota Sailing Squadron for being excellent hosts, welcoming visitors and their passion to put on a fantastic event. The visiting UK contingent had a great time situated at the SSS's idyllic peninsula location. We had great sailing on beautiful waters and spotted wildlife including dolphins, pelicans and egrets but no sharks or 'gators this time! We had a lovely swim off Sarasota's pristine beaches in the Gulf of Mexico, a St Patricks day night out downtown and a scenic drive across the Everglade's 'Alligator Alley'. Truly a memorable trip! 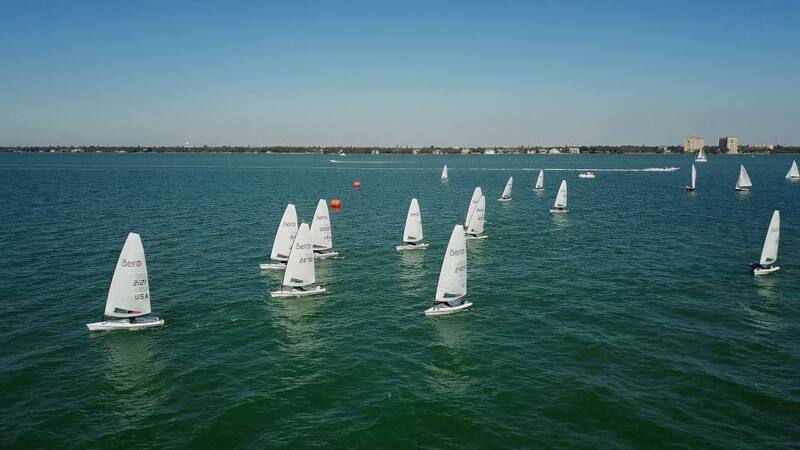 The RS Aero North American Midwinter Series has just one more regatta at Clearwater next month, during the RS Feva World Championship, before the Mega Tour trailer moves on to Texas then New England. One thing is for sure, there is lots of RS Aero momentum in the South! - May 17-20th in Galveston, TX: KO Sailing RS Aero North American Championship at the Sea Star Base Galveston, Houston. There are too many upcoming events to list... RS Aero action happening everywhere from Seattle to Florida! For a complete schedule visit the North American Events List. 2 - Technique & Tuning movie in 360' video with Marc Jacobi, showing both sail trim and technique! Wind 7-10kn. Marc's notes are on the Youtube page.